Butter beans are sold fresh, dried, canned or frozen. The canned kind are ready to eat, but other forms of butter beans need to be cooked before they can be consumed. Cook butter beans on the stove, in a pressure-cooker or in a slow-cooker. They're best cooked for a long time at a low temperature or for a short period at a high temperature to preserve their shape. 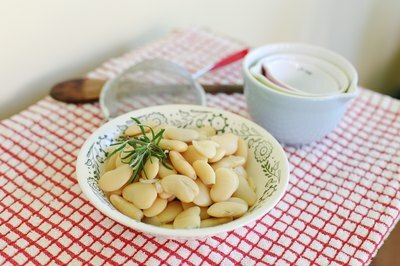 Dried butter beans require soaking before they can be cooked. Soak the beans in cool water for a minimum of five hours and as long as eight hours or overnight. Ensure that the beans are fully submerged. The longer they soak, the softer and creamier they'll be. Do not use the soaking liquid to cook the beans, as sugars -- which produce gas when consumed -- are released by the beans into the liquid. Fresh or frozen butter beans do not require soaking before cooking. Fresh beans only need to be rinsed to remove debris and cooked as is. Defrost frozen beans before cooking. Both fresh or frozen butter beans still require fairly long cooking times -- as long as an hour on the stove. Soaked and fresh beans require simmering for about 60 minutes on the stovetop and need a lot of liquid to develop their soft, creamy texture. Use a 1-to-3 ratio of beans to liquid, such as stock or water. Add dried spices, chopped aromatics, and fats or pieces of seasoning meat, such as bacon or salt pork, at the beginning of the cooking process. Add salt after the first 10 minutes of cooking, once the skins have softened, to give it a chance to penetrate. Add acids, such as tomatoes or vinegar, at the end of the cooking time, as they can prolong cooking times. A slow-cooker cooks beans at a controlled temperature and requires very little attention. Use plenty of liquid -- at least a 3-to-1 ratio of liquid to beans -- and avoid adding acids until the end of the cooking period. On the low setting, fresh butter beans will cook in roughly four hours, while soaked dried beans will be ready in five to six hours. Pressure-cookers use high temperatures to quickly soften and cook beans. Because too high of a temperature can lead to mush, pay close attention to pressure settings and cooking times. Add seasonings, including salts and cured meats, at the beginning and acids after the beans are fully cooked. Use a 4-to-1 ratio of liquid to beans, and clamp on the lid securely before placing it over heat. 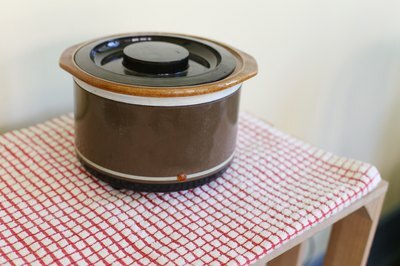 Never fill a pressure- cooker more than 2/3 of the way full, and if you hear sputtering, remove the pressure-cooker from the heat and check the valve, as it is likely clogged. Dried beans need to be soaked before cooking in a pressure-cooker. Dried, large butter beans that have been soaked for 12 hours will be ready in four to seven minutes. Canned butter beans are ready to eat and do not require further cooking, although many people at least heat up the beans before consuming them. 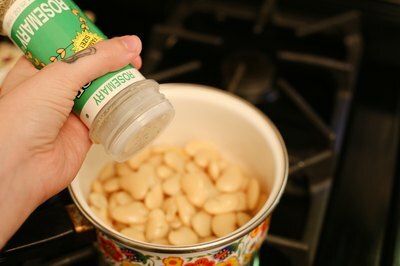 Drain butter beans into a colander and rinse them under cool water to remove the canning liquid, and use the canned beans as you would cooked beans. They will not hold up well to long cooking times, however, and are more prone to disintegration when cooked at high temperatures. Heat up canned beans on the stove or at a low setting in a slow- cooker. Canned beans do not need much added liquid and can be eaten as soon as they are warmed through, around 10 minutes on medium heat on the stove. Season canned beans as you like and at any time during cooking.